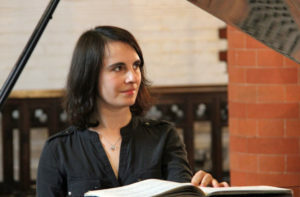 St Albans Symphony Orchestra’s concert at St Saviour’s Church on Saturday, May 12 was an all-Russian programme. It began with the hugely entertaining Festive Overture by Shostakovich in which the orchestra showed real energy and flair throughout, with particularly good playing from the brass in the opening fanfare. The problem with Tchaikovsky’s Piano Concerto No. 1 in B flat minor is that it is just about the most popular and over-performed in the repertoire, and it is difficult for a reviewer to be objective about it. The soloist was the hugely talented local international concert pianist, composer and conductor Alissa Firsova, who admitted to me afterwards that this was her first public performance of the work. I was astounded, as apart from a short passage In the last movement where she lost her way momentarily but soon recovered, it was an assured, fresh and polished performance, especially in the two cadenzas of the first half and the fast filigree work of the second movement. The orchestra played very sensitively throughout, and the balance between them and the soloist was fine. Stravinsky’s Firebird Suite Is an immense undertaking for any orchestra; particularly taxing are the fast and intricate opening Dance, the Scherzo and the Infernal Dance. In these there were some timing and tuning issues, but they did not detract from my overall enjoyment of a hugely challenging work. Particularly pleasing were the quieter movements, especially among the woodwind. The concert was conducted by Tom Hammond with his usual dynamism and aplomb. He is to be congratulated for achieving a very satisfactory performance of difficult works from what is a largely amateur orchestra.